When the rapidly intensifying storm made landfall near here on Oct. 10 with an estimated wind speed of 155 mph, some of these residents of Florida’s Panhandle lost everything or nearly everything. Even those who fared better than most awoke to a landscape forever altered and daily life upended – trees gone, homes damaged or destroyed, businesses darkened, schools closed, jobs up in the air, and a coastal region facing the uneasy question of how many of its residents would be coming back. 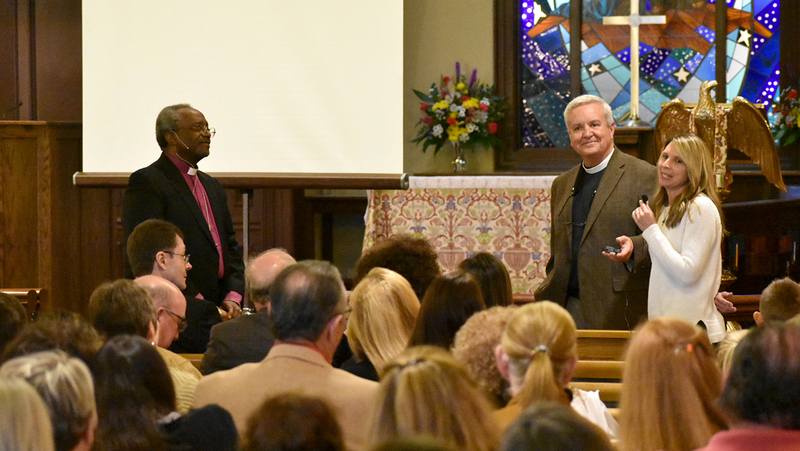 “To hear what you have done and are doing, therein is hope and grace and the power of love,” Curry said Jan. 12 at Holy Nativity, during the first of two listening sessions organized by the Diocese of the Central Gulf Coast. With the crowd filling every pew and spilling over to folding chairs on the sides and a standing area in the back, he praised them for their perseverance in the face of disaster. Curry’s first stop Jan. 12 was Holy Nativity Episcopal School, a few blocks from the church of the same name in The Cove, a beach-side neighborhood filled with modest houses and stunning oak trees. Hurricane Michael passed just east of Panama City, so its powerful Category 4 winds were aimed out to sea, sparing the city a devastating storm surge. At that strength, however, the wind did plenty of damage on its own, including to the school. 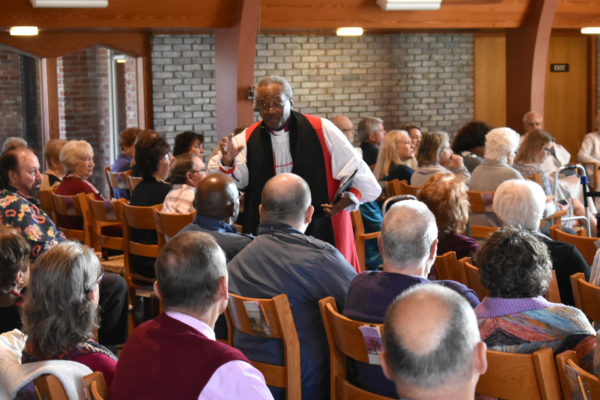 One of the trees felled by the storm landed on the school’s roof, creating a gaping hole over the school’s lobby and one of its classrooms, but as the presiding bishop arrived accompanied by Bishop Russell Kendrick, the progress on repairs was remarkable. A new roof was in place and renovations inside were well underway. Judy Hughes, Holy Nativity’s head of school, welcomed them into the lobby and kicked off her tour with a short video about the storm damage and repairs. A projector and screen were set up on floors still stripped to the baseboards, and the group watched the video standing under exposed rafters. Hughes’ goal is for her students to return to this school building by the fall, but their temporary accommodations are themselves quite an achievement. “We were the first school in Bay County to open,” Hughes said proudly. Classes resumed Oct. 29, in the hallways, courtyard and any other available spaces at Holy Nativity Episcopal Church, and in additional space provided for by St. Thomas by the Sea Episcopal Church in Panama City Beach. Teachers and students have since moved into 15 portable classrooms set up like a makeshift educational village on vacant land behind Holy Nativity Church, and spirits are running high again, Hughes said. The school, which teaches preschool to eighth grade, had about 285 students enrolled this year, and only about 20 have yet to return after the hurricane. “The church will be there 10 years from now,” Curry said later, during the short drive from the school to the church. The vehicle passed a man jogging through The Cove. “We’re long-distance runners. We’re not sprinters,” Curry added. Residents say that, in the initial aftermath of the hurricane, a massive amount of household debris was hauled to the curbs. Walls of junk rose along the sides of residential streets, broken only by the gaps left for driveways. 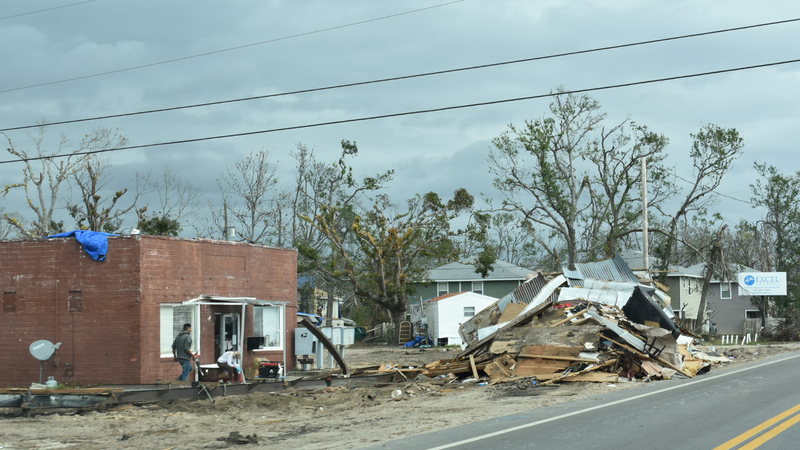 Now neighborhoods are beginning to look like neighborhoods again, with debris heaps still scattered here and there, some towering taller than houses – furniture, bricks, drywall, large appliances, siding, anything that might have broken free or been damaged during the storm. They shared stories of first responders’ heroic work, of one congregation’s newly homeless parishioners camping out in the parish hall, of neighbors sharing information over downed fences, of students glad to return to school to see their friends, of residents chipping in any way they could to help each other, and of a shared desire to return to daily life. Anna Eberhard said afterward that the presiding bishop’s visit was a tremendous personal boost for her and her family. 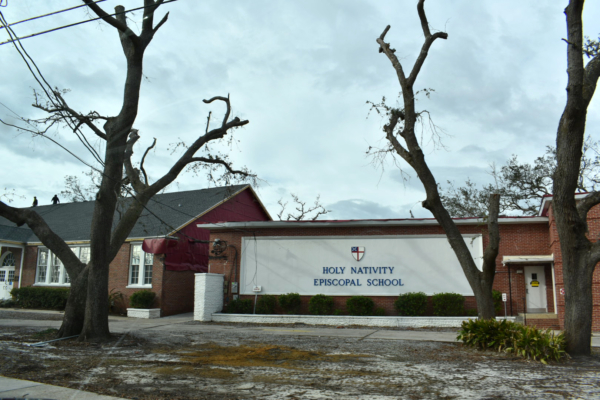 Eberhard, a teacher at Holy Nativity Episcopal School and a member of the church, was displaced after the storm, forced to move more than hour away to Walton County until her house is repaired. 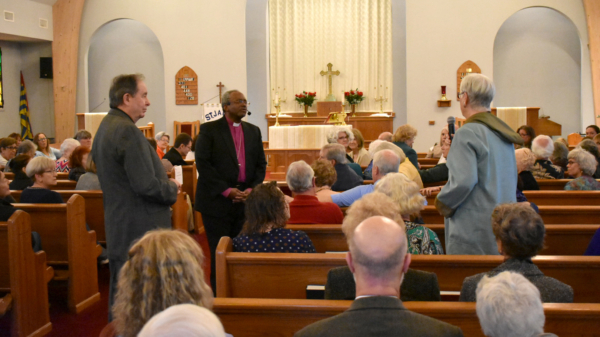 Curry’s second listening session was held at St. James Episcopal Church in Port St. Joe, Florida, a smaller coastal community east of Panama City. 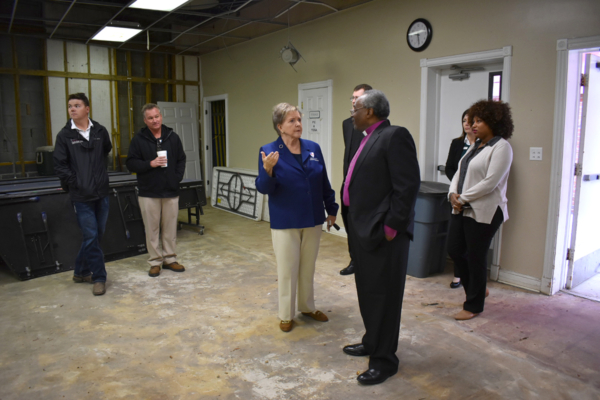 On the drive to Port St. Joe, the presiding bishop passed through Mexico Beach, the small community that was hit hardest by Hurricane Michael. 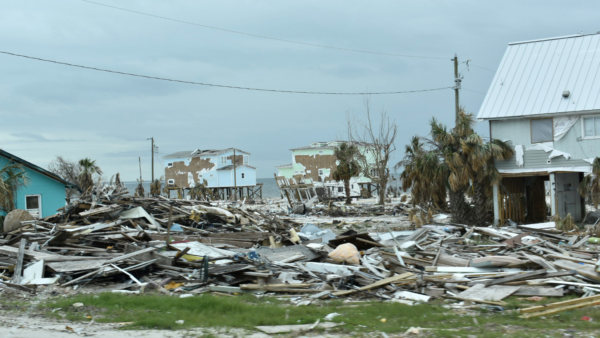 This region felt the brunt of Michael’s powerful storm surge, which virtually wiped out Mexico Beach. What is left of the community looked like a war zone, with buildings reduced to scrap or badly damaged. Roofs, if not missing altogether, were patched with blue tarp. The main road through town was dotted on the sides by pile after pile of debris, and part narrowed to one lane where roadway was eroded by the storm and had yet to be restored. Anna Connell, who moved to Mexico Beach with her three children about three years ago, worked a nurse at Bay Medical Sacred Heart Hospital in Panama City. 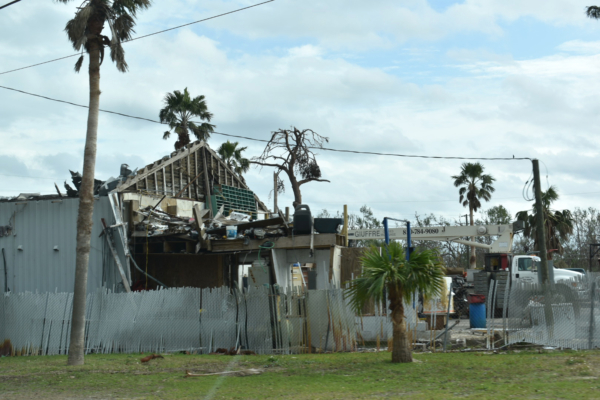 When the storm hit, the family fled, and when they returned, their house was gone. Connell also was left without a job because part of the hospital was destroyed.